Make sure that your computer is set up with ADB (Android SDK) incase you don't have the ADB or don't know how to set it up heres a YouTube tutorial for you to follow. Make sure that your Android device setting for "USB Debugging" is ENABLED or active. Make sure that your computer is equipped with necessary drivers and use your native USB cable. 1. Plug-in your device to your PC using your USB cable (works on Windows, Mac and Linux). 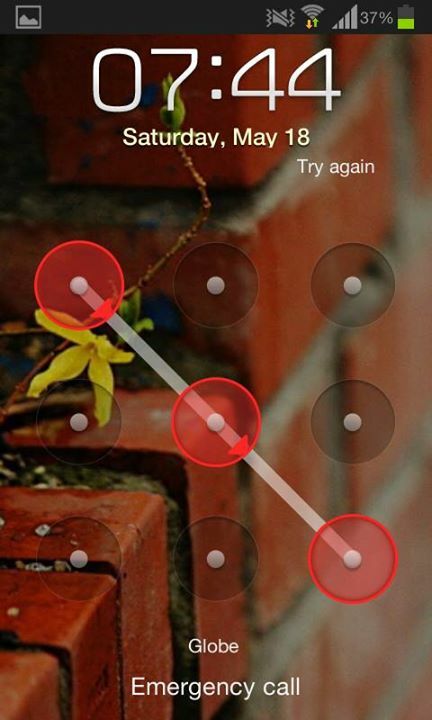 Make sure that you have an active pattern screenlock. 3. On the cmd window type in "adb shell" (no quotation marks) then hit enter. 4. After entering type "rm /data/system/gesture.key" (no quotation marks) then hit enter. 5. After the process you need to "REBOOT" your Android device (without unplugging it to your PC). 6. After your phone fires up unplug it to your PC then your good to go... CONGRATULATIONS you successfully bypassed your Pattern Lock Screen, your phone now will accept any pattern you will draw on the lock screen as VALID and CORRECT. Now if you're thinking that your phone's lock screen is not working properly. You can create a new Pattern password as normal as you did before the process like nothings happend. This will not hurt your phone's functions if you follow the steps.